cake as well as another wedding cake for a family member! Highly recommend!!!! Only one word describes Uniquely Cakes WOW! use Rochelle for any and all cake needs in the years to come. Thank you Rochelle for making our wedding spectacular. family and guests still talk about fondly. wonderful experience was the absolutely beautiful and delicious cake Rochelle prepared for us. She gave us wonderful care and attention and I could not be happier having her do our cake. exactly what we wanted for our wedding cake and was friendly and easy to work with. thinking of ordering another delicious cake! visit and get a cake the next time we're in the area just to eat through the week. I just wanted to thank you for the AMAZING cake you made for our wedding! It was delicious! I received many compliments on how the cake tasted and looked. You are awesome! ever had. We completely agree with them!! So THANK YOU again for the beautiful cake. On the day of the wedding you delivered the cake right on time and it was beautiful. they were all fabulous. There were so many compliments. Thank you so much for all of your help and for a wonderful cake. meeting with Rochelle and giving her product a taste. chocolate was divine... The french vanilla was such a distinctive and rich flavor. I have three more daughters... Guess where we will be getting their wedding cakes? Thanks again, Rochelle. Everything was wonderful. was beautiful and went along with our wedding decor perfectly, quite frankly. the look of it was the least important thing to me. disappoints. I heard all night long how absolutely wonderful the cake was. wedding, people devoured the cake and came back for seconds. refer everyone I know to her when they have a need for any type of cake. of their husband's! Thanks Rochelle, for helping to make our day so special. wanted for our special day. questions we had for her. or a better price anywhere else. Signed by very satisfied customers! cake, big or small for any occasions. and very patient while we picked out a perfect cake for our wedding day. to any future bride/groom couples. designing around. I concur with everyone on this page that it is the best cake. I can not recall having a better tasting cake anywhere, home-made or bought. just as valuable. 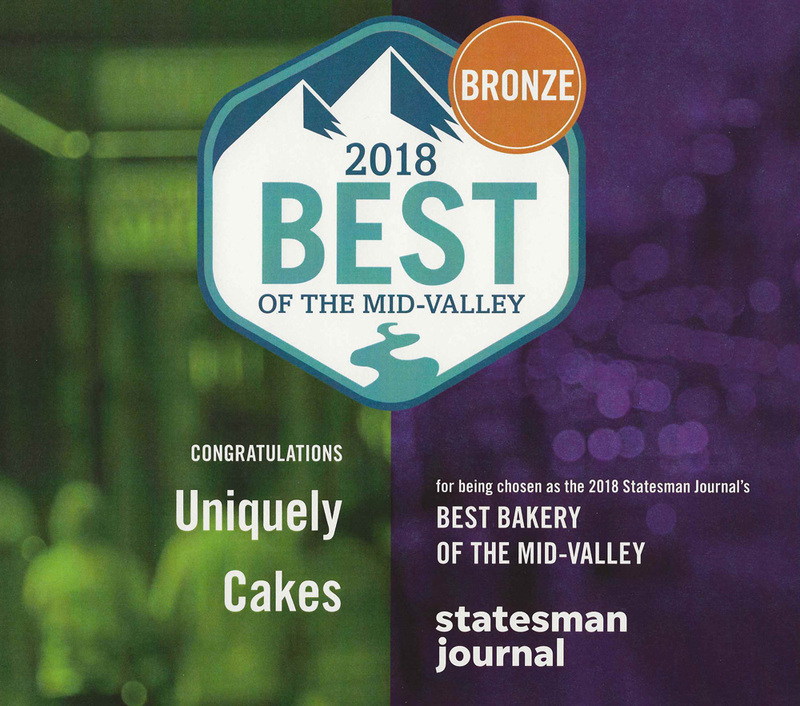 Uniquely Cakes is a cake-person's answer to good cake! Truly.